One of the most common questions we’re asked is, “When can I get RootsMagic on my phone or tablet?” The answer is, “Today!” We’re pleased to announce the official release of RootsMagic for iPhone, iPad, and iPod touch; a free companion app to our RootsMagic desktop genealogy software. Now you can easily take and show off your family history with you wherever you go. 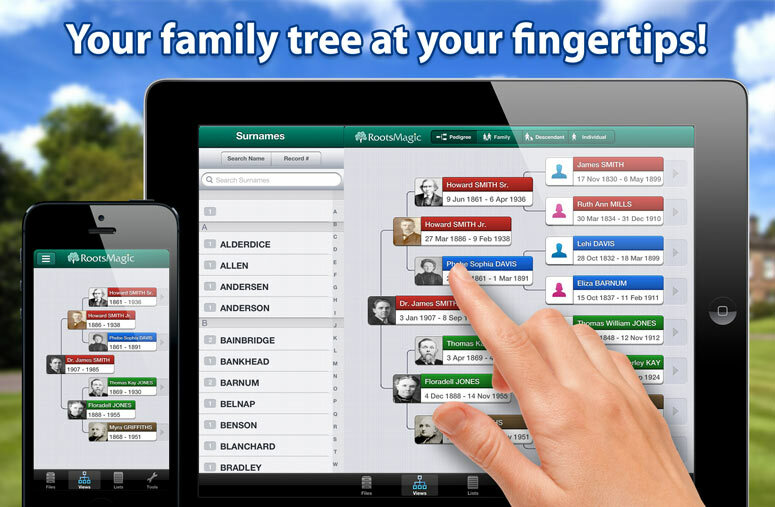 RootsMagic lets you carry your genealogy on your iPhone, iPad, and iPod touch! It’s fast, easy, and free! We see this as our first step into the mobile world and we’re interested in seeing how people use this app and evolving it to meet their needs. And before we get swamped with e-mails accusing us of neglecting owners of Android devices, rest assured that a version of the app for Android devices will be available in the near future. This is really great. Now I have somewhere to send my Windows-using friends who want a desktop app that works with their iPad. I don’t think there was a really integrated Windows/iPad genealogy app until now (there are several for Mac). Next step – RootsMagic for Mac. When will that be ready? And will it fully support importing Reunion files? This is wonderful!!! Any way it could become available for other tablets, like Amazon Kindle or Barnes and Noble Nook? Hi guys, this downloaded and installed fine, and the upload of the whole database was fast…like two minutes for 41,000 people. The one problem I had was reading the directions – had to use a magnifying glass on the iPhone. I couldn’t expand the text. The second issue is with the attached documents – same problem, I can’t expand them to see them. Is that the intent? Will you improve this in the future? Oh Happy Day! This is indeed great news. I was one of those asking for an iPad app, starting at least 1 1/2 years ago. Many many thanks! Excellent! I use an Android.. and wonder, which is easier a Droid or iPhone for this App? I dislike touchscreen only. Wish I could find a Ph with both TS & a keyboard. I currently have the ancestry application. Runs very slow. Excellent. Ready for Android. Thanks! As promised! This is great news. I’m hoping to see the Mac application of Roots Magic soon, and to use this iPad version with it. That will be the final step for me to persuade me to abandon Legacy, which I run in virtualization. Can’t wait for the Android version! Great news.. I hope this means and Apple version is coming soon. I, too, wish I could get Roots Magic on my Kindle. Is that a possibility? Thanks. Looking forward to an Android app! Was happy to see rootsmagic has an app for ipad only thing is that you can not edit your file using the ipad. Please work on this. Your app looks so nice. The Kindle uses the Android operating system so it will not work with the RootsMagic App for the iPhone/iPad/iPod Touch. We are currently working on the Android version of the app. The app for iPad is certainly welcome. When will we be able to edit on the iPad and link to Family Search? Looking forward to Android app. Don’t forget to allow for rotation and those of us w/ docking keyboards. Thanks for adding this. This is a great capability and makes Rootsmagic even better. I am looking forward for Rootsmagic to have a Mac version. That would be wonderful. I, too, am waiting for the Android app. This is great. Hopefully you are working on Roots Magic for Mac. Please hurry with the Android version. Thanks! This is great. Now that you have done this, I hope to soon see a version for the Mac. I am new to RootsMagic and am taking a class through the local university to be able to use it to its full capability. I am excited that I can load it on my iPhone. I would love to have it on my Nook, as well. Is that in the works? Yes, echoing that of others, please hurry up with the Android version. You must get Android app, it is slowly catching up. still waiting for android app but i won’t wait forever. I’d like to join the others and ask when your projected date for the Android version will be available. Soon, I hope! I’m really looking forward to it. to get GP set up to work between my desktop and Kindle and so far just can’t make it work.